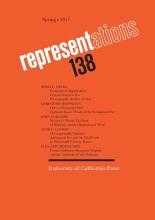 Upcoming in Representations 139: Debarati Sanyal’s update on the Calais “Jungle” and Sylvain George’s 2010 film Qu’Ils reposent en révolte, Yoon Sun Lee on bad plots in the novels of Maria Edgeworth, Dahlia Porter on botanical collection and literary anthologies, Carmine Grimaldi on the use video in the Haight-Ashbury “Hippie Drug Ward,” and Justin Steinberg on legal and literary mimesis in the Decameron (coming in August). This entry was posted in Issues, News by Reps Admin. Bookmark the permalink.